Up there in my favourite animals is the seal (not far behind the flamingo and the elephant) making me smile every time I see one. There expressive faces bring me an exceptional amount of joy. In fact, it was on Sunday just gone that I took myself to Horsey Beach in Norfolk to see the common seals they have there. Just as I got close enough the rain hit. We spent a couple of minutes watching these wonderful creatures before legging it back to the car. But it was well worth being caught in the downpour. Browsing the photos sent to us this week, I came across this content chap captured by Nathan Parry. It took me back to last Sunday and the fun I had down at Horsey Beach. 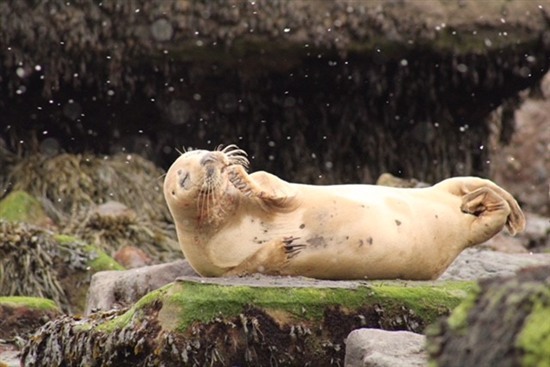 This one is for everyone that has had a busy week and will be relaxing this weekend (Photo courtesy of Nature’s Home reader Nathan Parry). Do you have some great photos you’d like to share? Send them to natureshome@rspb.org.uk.